In the Russian best-selling book series "The Ringing Cedars of Russia" by Vladimir Megre there is a tale of Siberian cedars (Pinus Sibirica), that stand for centuries absorbing cosmic energy from the Sun, planets, ethers and stars. Like many other plants, they grow to provide healing and sustenance to humankind. Siberian cedar has proven healing properties and nutritional values. We offer wide range of natural healh products like natural chewing gums, toothpastes, throat lozenges containing Siberian cedar products (Pinus Sbirica) like cedar resin, cedar nut oil, natural essential oils, cedarwood essential oil etc - widely used in everyday life and alternative medicine as holistic healing remedy. Bio cosmetics: Anesthetic massage cream with chaga, contains 100% natural ingredients. Action: Ease the pain during a massage, is suitable for treatment of injuries, sprains and inflammatory processes, reduced or increased muscle tones.&nb..
Cedar resin throat lozenges with propolis. Weight per box: 100 g. 10 lozenges in box. Contain: cedar resin, cedar nut oil, propolis, izomalt, mint oil, menthol, chlorophyll (natural dye). No sugar, no GMO. Please read the article about ced..
Cedar resin throat lozenges with propolis and lemon. Weight per box: 0.1 kg Contain: cedar resin, cedar nut oil, propolis, izomalt, lemon, honey. No sugar, no GMO. Please read the article about cedar resin properties and applications: http..
Action: provides epidermis cells nutrition by the biologically active substances that enhances skin protection function, restores elasticity of blood vessels, reduce stagnation in the joints and spine, as well as the prevention of premature wrinkli..
Natural chewing gum made of pure Siberian cedar resin. Weight per box: 0.06 kg 8 items in box. Please read the article about cedar resin properties and applications: https://ecominded.net/cedar-resin-nature-s-miracle..
100 % natural chewing gum made of Siberian cedar (Pinus Sibirica) resin. 8 items in box. Please read the article about cedar resin properties and applications: https://ecominded.net/cedar-resin-nature-s-miracle..
Natural chewing gum made of Siberian cedar resin with cranberry. Weight per box: 0.06 kg 8 items in box. Please read the article about cedar resin properties and applications: https://ecominded.net/cedar-resin-nature-s-miracle..
100% natural chewing gum made of Siberian cedar resin (turpentine) with sea buckthorn oil. Please read the article about cedar resin properties and applications: https://ecominded.net/cedar-resin-nature-s-miracle..
Natural chewing gum made of Siberian larch resin. Weight per box: 0.06 kg 8 items in box. Please read the article about cedar resin properties and applications: https://ecominded.net/cedar-resin-nature-s-miracle..
Natural chewing gum made of Siberian larch resin with pepermint. Weight per box: 0.06 kg 8 items in box. Please read the article about cedar resin properties and applications: https://ecominded.net/cedar-resin-nature-s-miracle..
Natural chewing gum made of Siberian larch resin with propolis. Weight per box: 0.06 kg 8 items in box. Please read the article about cedar resin properties and applications: https://ecominded.net/cedar-resin-nature-s-miracle..
Sugar free! 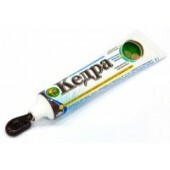 throat lozenges Kedra is made of the cold pressed whole cedar cone (nuts, shells, resin etc). Addition of propolis encreases bactericidal and refreshing effect. Please read the article about cedar resin properties and applications..
Sugar free throat lozenges Kedra is made of the cold pressed whole cedar cone (nuts, shells, resin etc). Addition of sea-buckthorn encreases bactericidal and refreshing effect. Please read the article about cedar resin properties a..
Sugar free throat lozenges Kedra is made of the cold pressed whole cedar cone (nuts, shells, resin etc). Please read the article about cedar resin properties and applications: https://ecominded.net/cedar-resin-nature-s-miracle.. Contains: Cedar nut cake (cedar nut oil byproduct) and cedar nut shells, grounded by special technology; Cedar nut cake is rich in polyunsaturated fatty acids such as linolenic, linoleic, vitamins A, E and B. The B vitamins provide regenerative fu.. Contains all components of Siberian cedar (Pinus Sibirica) processing: propolis, cedar nut oil, cedar resin, cedar shell powder, cedar nuts presscake, and cedar essential oil. Cedar nut oil of the Ringing Cedars of Russia brand is produced in ecol.. Contains all components of Siberian cedar (Pinus Sibirica) processing: cedar nut oil, cedar resin, cedar shell powder, cedar nuts presscake, cedar essential oil and mint essential oil. Cedar nut oil of the Ringing Cedars of Russia brand is produce..
Sugar free throat lozenges Kedra is made of the cold pressed whole cedar cone (nuts, shells, resin etc). Addition of mint and menthol encreases bactericidal and refreshing effect. Please read the article about cedar resin propertie..